New Zealand’s National government is currently pushing through (under urgency) law changes to expand the powers of our state eavesdroppers and spies (including the Government Communications Security Bureau, GCSB). 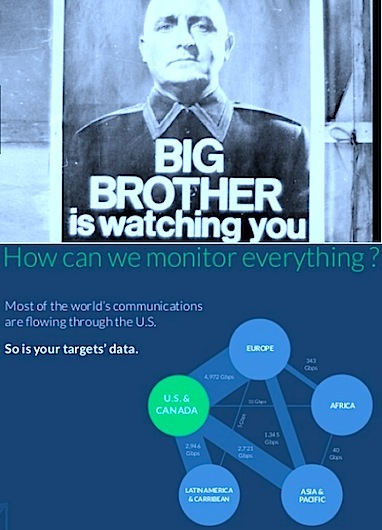 NSA Whistle-blower Edward Snowden this week highlighted the ongoing operation by the US and its allies (including New Zealand, Australia, Britain, Canada, ‘Five eyes’) to hoover up internet and telephony data — of millions of people, not just those deemed to be ‘terrorist threats’. So how apposite that the BBC should broadcast this wonderful documentary by political history professor Steven Fielding: Very British Dystopias. I listened to it on BBC Radio 4 early this morning. It’s all good (link below) but I was struck by this section, describing how it is that those on ‘the left’ see state surveillance through a different lens to their conservative co-citizens. The bitter polarisation of politics that defined the Thatcher era influenced how writers imagined the future in other ways. In particular, they focused on the role of intelligence services. They rejected the depiction of spooks as defenders of democracy perhaps best embodied by James Bond, instead they showed the security services acting against critics of the government and its contentious policies. David Aaronovitch: “That period in the mid 80s, quite a lot of people felt that they were what Mrs Thatcher called ‘The Enemy Within’, because they weren’t in favour of nuclear weapons, they were in favour of nuclear disarmament — and don’t forget this was also a very bad moment in the war in Northern Ireland, in the dirty war in Northern Ireland, so there was a lot of secrecy. Some feared innovative computer-based technologies now allowed government to at last emulate Big Brother. Robert McCrum’s novel In The Secret State, which was published in 1980, anticipated the left’s increasing mistrust of the intelligence services. Q: And what was the message? McCrum has intelligence officers, some with more enthusiasm than others invade the privacy of those innocent of any crime except that having the wrong political views. I think it’s fair to say that the reason ‘the left’ in New Zealand — including the Green Party — are responding more negatively to revelations of cronyism and law-breaking by our security/intelligence agencies is that they (including anti-nuclear campaigners, trade unionists, greenies/environmentalists, Occupy protestors and Treaty of Waitangi activists) have been the TARGET of the state security apparatus within living memory. Add to this the questionable process of the Ian Fletcher appointment as head of GCSB and the Prime Minister’s shifting stories about that and the Kim Dotcom raid — and the proposed rushed re-writing of the law in response (read that again) — and unease is bound to be the result. Call me paranoid if you like, but I share that unease, frankly. Beneath the calm surface of British politics, lurking in the imaginations of some of our leading writers, terrible things have happened. Professor Steven Fielding examines these dystopian visions which have gripped creative and public imaginations in novels and dramas since the end of the second world war. British democracy has come under threat time and again in fictions from 1984 to V for Vendetta, by way of Dr Who, The Prisoner, A Very British Coup, Edge of Darkness and others. Britons have been oppressed by authoritarian governments, suffered alien subjugation, been threatened by extremist nationalists in Scotland, endured American-backed coups and faced Soviet attempts to install a Marxist-Leninist Prime Minister. The intelligence services have gone from hero to zero and back again, while more recently elected politicians themselves have threatened democracy. Some of these stories have left a lasting legacy on our politics: references to 1984 have become part of our culture, and the iconic Guy Fawkes mask from the film V for Vendetta is worn as a symbol of resistance by protestors around the world. But why? And wherein lies the appeal of these visions of politics gone bad? Steven Fielding asks what the authors intended, and whether these visions make a useful contribution to the political process. He shows how these imagined futures were rooted in the real concerns of times in which they were imagined. And at a time when the politics of Westminster is seen as increasingly irrelevant by many people, he asks what can dystopian visions achieve now? Interviewees include authors Douglas Hurd, Chris Mullin, Frederick Forsyth and David Hare. Steven Fielding is Professor of Political History at the University of Nottingham. The producer is Jane Ashley.